INTRODUCTION: The International Subarachnoid Aneurysm Trial confirmed endovascular treatment as the treatment of choice for intracranial 'berry' aneurysms. The durability of coiling and the relevance of stable neck remnants needed to be addressed next. METHODS: We retrospectively assessed the follow-up angiograms of patients who presented with subarachnoid haemorrhages or third-nerve palsies and had berry aneurysms treated endovascularly between 2002 and 2003. Patients were phoned to assess their wellbeing and to see whether they were back at work or not. Angiograms were assessed to ascertain the percentage of the aneurysm coiled at the initial procedure, and then stability was assessed by percentage change in the residual aneuysm neck on later angiograms. RESULTS: Over a 1-year period 75 patients were treated endovascularly; 100% occlusion was achieved in 52% at the initial procedure, and although only 40 and 34 respectively attended for 3-month and 1-year follow-up angiograms there was a trend toward progressive thrombosis in 65% and 82% respectively. In only 1 of the neck remnants was growth noted at the 3-month angiogram. One patient bled after missing his 3-month follow-up angiogram. Although only 40% of the patients were contactable at 4 years there were no rebleeds among them. CONCLUSION: Coiling is durable, as shown by our results over a 4-year period, and while neck remnants that look unchanged are generally stable any growth should be viewed as grounds for concern and treated either endovascularly or surgically if required. The 5-year angiogram may be unnecessary, which is of importance in our setting where socio-economic factors influence patient follow-up. Endovascular treatment has been confirmed as the treatment of choice for intracranial berry aneurysms.1 While initial doubts on the part of microvascular neurosurgeons were addressed by the International Subarachnoid Aneurysm trials, the durability and long-term efficacy of coiled aneurysms have been questioned.1 A reason for this is the morphology that may be evident in coiled aneurysms on angiographic follow-up. Comment on the significance of the morphological angiographic picture requires adequate follow-up, which means that institutions treating aneurysms need to audit their results so that larger numbers can provide a clearer understanding. Following up patients angiographically may also clarify the natural history of neck remnants. The idea that an aneurysm needs to be treated so as to give a perfect radiological picture may not necessarily be true. We investigated the impact of our treatment of subarachnoid haemorrhage and showed that after the introduction of endovascular treatment the time to treat patients was reduced and consequently the rebleeding rate dropped.2 We now needed to establish that these benefits were sustainable. Although we have been using endovascular treatment for aneurysms since 2000, for this study we looked at patients treated between 2002 and 2003 because we had sufficient numbers and long enough follow-up (between 3 and 4 years). Our technical skills had improved and were closer to the standard in other institutions. All aneurysms treated endovascularly from February 2002 to February 2003 were analysed using procedure records and angiographic pictures. Our routine is to do follow-up angiograms after the initial procedure and at 3 months, 1 year and 5 years, provided there are no problems concerning treatment or stability of the coiled aneurysm. Should there be grounds for concern the angiograms are repeated as often as required. If the 3-month follow-up necessitated recoiling, the angiogram would be repeated 1 month after the procedure. We compared our percentage of aneurysms successfully coiled at the initial procedure with the 3-month and 1-year follow-up angiographic findings. We were particularly interested in seeing what happened to residual neck remnants, which were graded according to the classification of Roy et al3 as more than 90% if there was more than just neck filling (such as the aneurysm still filling), 91 -99% if there was no aneurysm filling but neck filling, and 100% for a complete result. We intended to determine how many remnants were stable, how many deteriorated, and whether some improved. Patients were contacted to assess their wellbeing and to find out how many were back at work. During the period 2002 - 2003 we treated 75 patients. There were 84 procedures done (Table I). The aneurysms we treat tend to be small sacular aneurysms, the vast majority measuring between 2 mm and 6 mm. We try to avoid remodelling, but used stents in 5 cases and balloons in 2. In 9 cases we failed to coil the aneurysm. The reasons for failure included difficult access, unfavourable neck-to-dome ratios or wide necks, and aneurysms that were too small or were thought to look like dissections rather than typical 'berry aneurysms'. One patient rebled and died the night before her procedure, and another died while her aneurysm was being treated with Onyx, which we no longer use to treat aneurysms. The results of coiling at the end of the first procedure are shown in Table II. Of the patients, 40 (approximately two-thirds of available patients) had 3-month follow-up angiograms. At 3 months 6 patients had a further procedure, but in only 2 cases was it necessary to recoil an aneurysm. In the other 4 patients another aneurysm was treated (Table III). Twelve patients showed progressive thrombosis of their aneurysms, so further intervention was not deemed necessary; 6 patients had residual necks that were thought to be stable compared with their original angiographic picture, and 3 patients developed more residual filling of the aneurysm, in 2 cases to less than 90% so the aneurysm had to be recoiled. One patient died of leukaemia before he could be retreated, and one patient, who had less than 90% occlusion at initial treatment, was found to have had progressive occlusion of the aneurysm. After the 3-month angiogram 4 further patients died from unrelated medical problems. One-year follow-up angiograms were done on 34 patients out of a possible 58 (59% of the patients who could have been followed up) (Table IV). Two patients had further occlusion to 100%. In 5 patients the remnant remained stable and in one patient a remnant that had increased in size to <90% required recoiling. One patient had been referred to us from another unit where an attempt to clip a posterior communicating artery aneurysm had failed as the neck was heavily calcified. We were able to coil the aneurysm and achieved occlusion of >95% on initial coiling. The patient defaulted from follow-up and missed his 3-month angiogram but re-presented having re-bled as a World Federation of Neurosurgeons (WFNS) grade 1. His angiogram revealed coil compaction with <90% occlusion. The aneurysm was coiled again with close to complete occlusion. A 3-month follow-up angiogram showed a stable result. Another patient had neck growth rather than coil compaction. This patient had three endovascular procedures that failed to treat the aneurysm satisfactorily. At each 3-month follow-up angiogram there was a >90% residual neck. Surgical clipping of this aneurysm proved extremely difficult and even though a clip was applied over the neck the pressure was too high and there was insufficient space to apply a booster clip. The patient rebled and died in the intensive care unit. At or after 4 years we were able to contact 30 patients to assess their wellbeing; 10 (one-third) were still working. The 28 patients about whose wellbeing we are uncertain were uncontactable. The Guglielmi Detachable Coil (GDC) was introduced in 1991 with Food and Drug Administration approval in 1995.4 By August 2002 over 100 000 patients had been treated with GDC coils and the first randomised prospective study of coiling versus clipping confirmed the 1-year advantage of the former with regard to prevention of death and dependency. Critics of coiling initially silenced by the ISAT results came back with scepticism regarding the long-term durability of coiling.1 Although it was not significant, the higher rebleeding rate in the ISAT trial was pointed out and questions were asked about the significance of aneurysmal neck remnants. It was therefore considered important to address these criticisms by studying the long-term follow-up of coiled aneurysms. Initially it was not clear what 'long term' represented and it was felt that ongoing studies might shed light on this question. In 2006 Henkes et al. published early angiographic and clinical results.5 They commented on the paucity of data on long-term coiling results and that these series were small and may have been affected by uncontrolled factors and inconsistencies. For example, two of the articles were concerned only with posterior circulation or basilar tip aneurysms, which reflected the attitude to endovascular treatment of aneurysms. In 1999 Byrnes et al. published their 5-year experience with coil embolisation for ruptured intracranial aneurysms, looking specifically at outcomes and incidence of late rebleeding,6 and in 2002 Batista et al. published their 5-year angiographic and clinical results of coiled aneurysms.7 Despite these and other publications scepticism persists. In 2006 the CARAT Investigators commenced a study of delayed rebleeding rates in coiled and clipped aneurysms8 because of 'a paucity on long-term outcomes' which is a 'major concern'. For this reason we also decided to study our long-term results. Ultimately the reason for hesitancy in accepting coiling of aneurysms as a treatment is the concern that they will re-bleed, which long-term follow-up will address. Microvascular surgeons are especially sceptical about aneurysmal neck remnants. Continuous and long-term follow-up will assist in defining how long 'long-term' is in following up coiled aneurysms. Although it is our protocol to do angiographic follow-up at 3 months, 1 year and 5 years, it may prove unnecessary to wait 5 years and that two unchanged consecutive stable angiograms is enough. Our follow-up of between 54 and 60 months is better than Byrnes et al. 's 5-year experience of between 6 and 65 months (median 22.3 months) and closer to that of Batista et al., who had 5-year follow-up.6,7 Like us, Batista et al. found it difficult to follow up all the patients initially entered into their study. Of the 102 patients who had aneurysms coiled, 85 had 1-year angiographic follow-up but only 45 had 5-year follow-up.7 Of our possible 59 patients, 34 had 1-year angiographic follow-up. Since at 4 years we could contact only 30 patients, 5-year follow-up numbers will be low, which is to be expected because of the socio-economic factors and our referral patterns. However the low number of follow-ups highlights the importance of establishing how durable coiling is so that unnecessary follow-up is avoided. 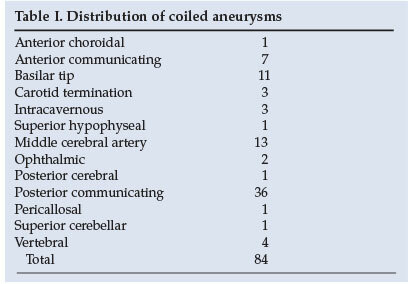 Analysis of the aneurysms coiled shows that there was a high percentage of internal carotid artery aneurysms. Just under half of the aneurysms treated were posterior communicating artery aneurysms, not because we selected them to coil but because they seem to have a high incidence in our population.9 The proportion of middle cerebral artery aneurysms that we coiled is higher than in other studies,1,5,10 because we believe that partial coiling has a protective effect. As primary interventionalists, whether the aneurysm is treated endovascularly or surgically we have a low threshold for clipping an aneurysm if in doubt as to whether it can be treated safely. Our threshold for clipping MCA aneurysms is low. Our initial 100% occlusion rate was 39 (52%) out of 75, which is within the limits of those in other studies that show lower (39%) and higher (63%, 88%) 100% occlusion rates.5,11,12 When Kole et al. critically assessed their 100% occlusion results they found that only 16% of their patients had 100% while 57% had >91% occlusion.13 On the initial follow-up angiogram 12 (30%) of our patients had progressive thrombosis to complete occlusion. In other words although there was residual aneurysmal neck after the initial coiling, in 30% of patients there was progression to complete occlusion at the 3-month angiogram follow-up. This is in keeping with findings elsewhere11 and translates into 65% complete occlusion at 3 months. At the 3-month angiographic follow-up 6 of our patients had stable neck remnants. We consider neck remnants stable if the aneurysm is >95% treated and looks unchanged on the 3-month follow-up angiogram. If there is any concern over a remnant it is either treated or followed up sooner with a repeat angiogram. Of our patients, 3 patients had increased filling of the aneurysm on the follow-up angiogram; in 2 the initial occlusion was not 100%, but in the third occlusion was judged to be 100%. This patient seemed to show neck growth rather than the coil compaction seen in the other 2. Despite three attempts at re-treatment the neck continued to grow and even surgical intervention failed to save the patient. We have become very wary of neck growth and in this situation have a lower threshold to proceed to clipping. Three other patients in our series haemorrhaged: one was transferred to us with a basilar tip aneurysm and bled the night she arrived in the intensive care unit; another had a dissection of the internal carotid artery while her posterior communicating artery aneurysm was being treated with Onyx, which we no longer use for aneurysms; and the third patient was referred to us with what had been considered an unclippable posterior communicating artery aneurysm, which we were able to coil with a satisfactory result of between 95% and 99% occlusion. This patient defaulted from his 3-month angiogram, represented with a World Federation of Neurosurgeons grade 1 subarachnoid haemorrhage, and had his aneurysm coiled; a follow-up angiogram showed a stable remnant. We are unable to do auto-triggered elliptic-centric-ordered three-dimensional gadolinium-enhanced magnetic resonance angiograms at our hospital, but in elderly patients who have had an aneurysm coiled we do more time-of-flight magnetic resonance angiograms, especially if happy and confident about our initial coiling result. We would ideally like to do more magnetic resonance angiograms as follow-up, since we believe this provides enough information on which to base a decision whether or not to re-treat an aneurysmal remnant. In our previous study of the impact of endovascular treatment of aneurysms we found that the reduction we achieved in the time to treat SAH patients has reduced the in-patient rebleed rate.2 This is logical considering that the re-haemorrhage rate is highest in the first 48 hours, as was found in the ISAT trial.1 To treat our patients as expediently as possible, procedures in WFNS grade 1 or good grade 2 patients with posterior communicating artery aneurysms are done under local anaesthetic; we have done this in at least 12 cases, with good results. Unlike experience in the ISAT trial, we are not aware that any of our coiled patients experienced post-procedural haemorrhages. Our single rebleed occurred in a patient who had undergone both clipping and coiling, highlighting the fact that both treatments are susceptible to failure. To assess our results better we contacted as many of our patients as possible. Because we are a referral hospital with patients coming from considerable distances, and because of socio-economic factors, follow-up is sometimes difficult. Two patients who had not had 1-year follow-up angiograms refused to come in 3 years after coiling because they said they were 'fine'. Because we are primary interventionalists and can offer coiling or clipping, we try to eliminate cases in which coiling would be a high-risk procedure and rather treat them operatively. This is especially true of dissections, which are treated surgically in the anterior circulation. This policy should not influence our results with regard to re-haemorrhage rates in coiled aneurysms; however, it will affect our re-haemorrhage rates in clipped aneurysms, as aneurysms that are not coilable tend also to be difficult to clip. Rates of rebleeding from coiled aneurysms are coming down. The CARAT investigators8 found a re-rupture rate of 0.11% annually, which is in keeping with our findings. Porter et al.14 observed a de novo aneurysm formation rate of 0.76% per year, but others have found this to be nearer 2%. The de novo aneurysms could also account for 'rebleedings' that are reported to be from the coiled aneurysm but in fact are not. In our opinion dissections of the anterior circulation should not be treated with coil embolisation, and it is possible that endovascular treatment of these aneurysms in other series contributes to the rebleed rate. New softer coils and coils with complex shapes allow better packing of aneurysms. Tamatani et al. showed that aneurysms remained stable if the packing density was 30.8±10.2% but not if it was 19.9%±10.6%.15 It can therefore be postulated that newer coils will produce more stable coiled aneurysms. Our study, like those of Thornton et a/.11 and Batista et al.,7 found that remnants that were stable at 1 year remained stable. It therefore appears that follow-up after 1 year is unnecessary in stable coiled aneurysms. Our thrombo-embolic complication rate was approximately 5%. Two of these episodes occurred in the course of remodelling; however, no patient suffered permanent morbidity or mortality as a result. We did not use the Glasgow Outcome Score or Modified Rankin Scale to assess patient outcomes. Instead we ascertained whether patients were able to go back to their previous occupation, as we believe that neither of the above scoring systems is particularly sensitive in assessment of patients' higher mental status.